(Nanowerk News) Researchers at the University of Tokyo have shown that in phase separation in liquids, as is seen when oil and water separate, occurs as a result of the ordered motion of droplets ("A novel coarsening mechanism of droplets in immiscible fluid mixtures"). Initially, a great number of small droplets are formed which then grow into larger (coarse) droplets, and such coarsening of droplets proceeds as a result of the regular motion of the small droplets. This is contrary to the conventional belief of more than 30 years that random motion and resulting droplet collision and coalescence is responsible for phase separation. Phase separation is a universal phenomenon that can be observed in many common situations, such as when oil and water in a salad dressing separate out after having been well shaken. It is known that the mechanism by which droplets grow depends on the volume ratio between the two liquids. In particular, for an intermediate volume ratio between the two liquids, neither extremely large nor extremely small, it is known that coarsening proceeds by droplet collision and coalescence. 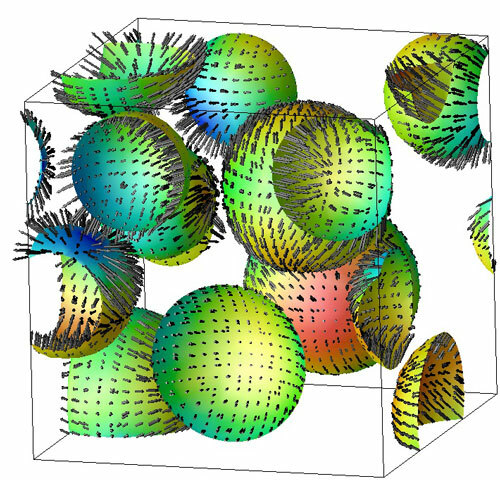 Professor Hajime Tanaka and Postdoctoral fellow Ryotaro Shimizu at the Institute of Industrial Science used simulations to show that the collision and coalescence of liquids, which was believed for a long time to be driven by random thermal Brownian motion of droplets. Contrary to this, the research group has shown that it is in fact driven by the regular motion of droplets due to local concentration differences that arise as a result of differences in droplet size. Specifically, when a large droplet is near a small droplet they approach each other, while droplets of equal size move apart. This mechanism can be understood as a consequence of dynamical coupling between concentration diffusion and fluid flow. This finding indicates that transport can be due to either diffusion, flow, or a combination of the two, but always takes place from smaller to larger domains: domain coarsening obeys the rule that “big always wins over small.” This also has implications for how systems evolve in non-equilibrium processes.